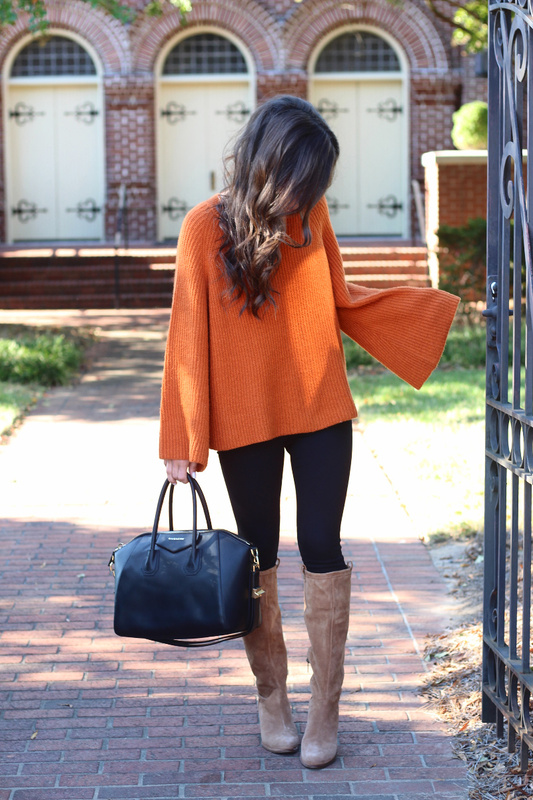 I absolutely LOVE the bell sleeve trend and had heart eyes all over this sweater when I bought it a few weeks ago! It's my favorite fall sweater purchase so far. 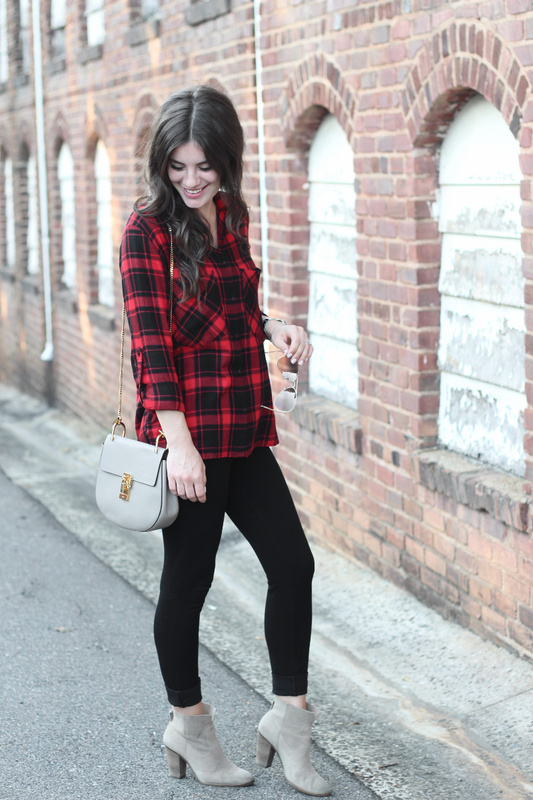 It is beyond cozy & just so chic! It also comes in a dark green and ivory which I also love! 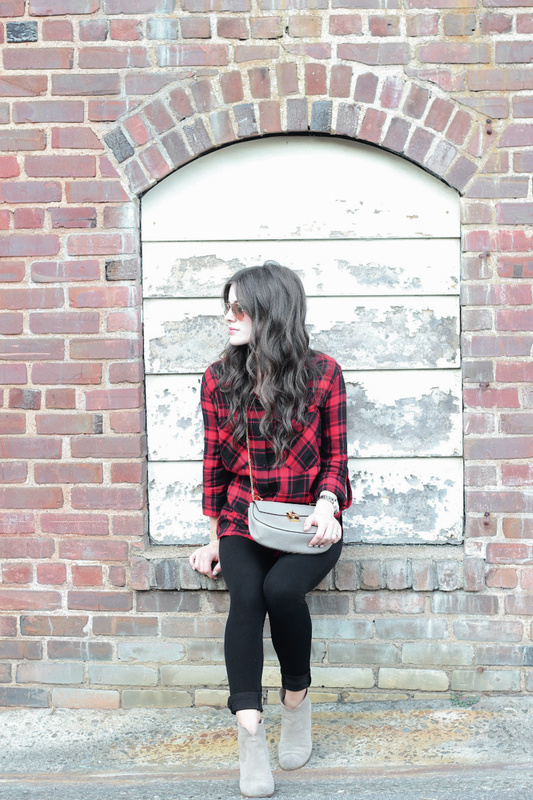 Also, I highly recommend these knee high boots. I bought them during NSale and was finally able to pull them out. They are so soft/warm on the inside and go with everything. I also love that I didn't have to keep pulling them up; they didn't slouch like I thought they would. 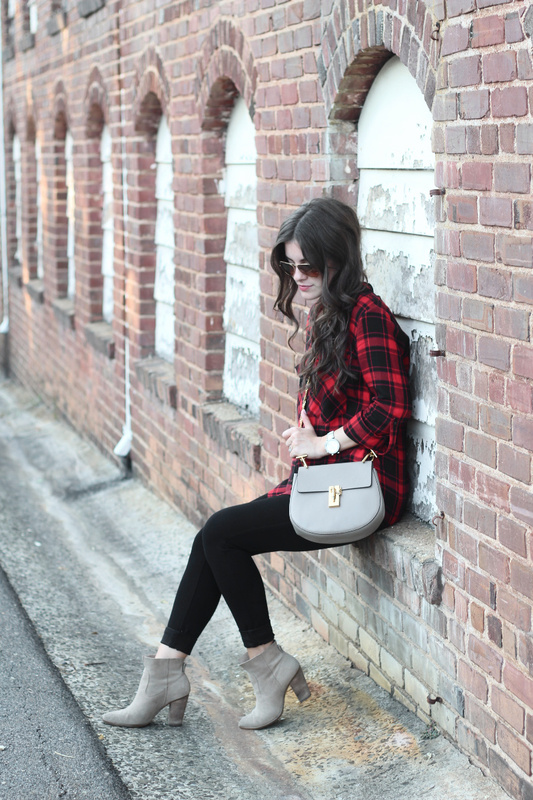 Click the image above to explore Stuart Weitzman Lowland boots and the color options. 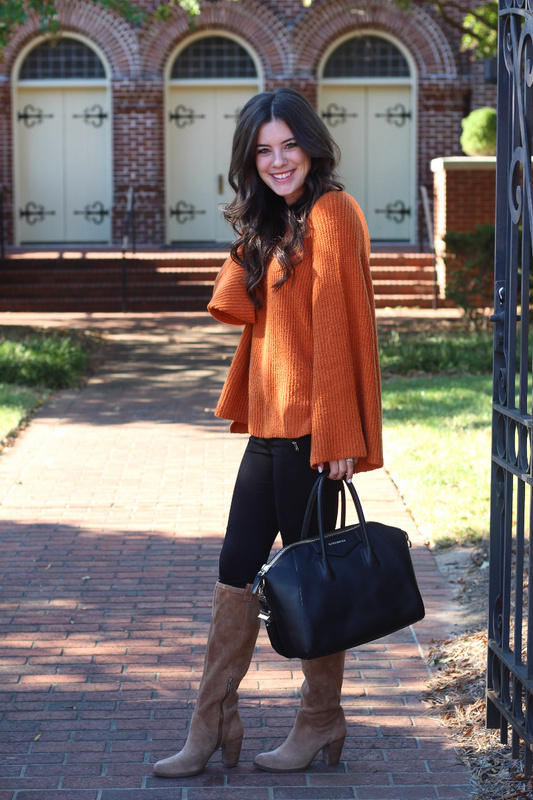 In the widget below, I have rounded up 5 Stuart Weitzman Lowand Boots dupes. Some of them are even under $100! 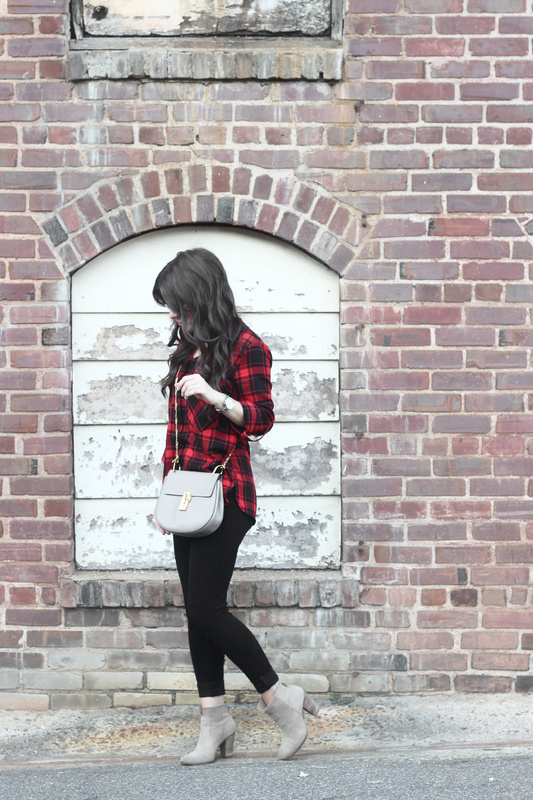 So, if you do want to invest in a pair of Stuart Weitzman Lowland boots, I do recommend sizing up half a size. My usual size was a little snug wearing socks, so half a size up fit perfectly. They do fit like a glove and slouch just slight enough to be easy to walk in, but not enough to look sloppy. They really are gorgeous boots, and if it weren't for the price tag I would have them in all seven colors! I do have them on top of my wish list, but until then I will be trying out these dupes. I bought THIS pair in taupe today, and after reading the reviews I am excited to try them on when they come in! They look so much better in the customer pictures and from what they have said, loved them as a dupe! Make sure you read the customer reviews for sizing/color match/etc. when searching for the dupes. Let me know in the comments below if you own any of them or found any dupes I missed in this post! 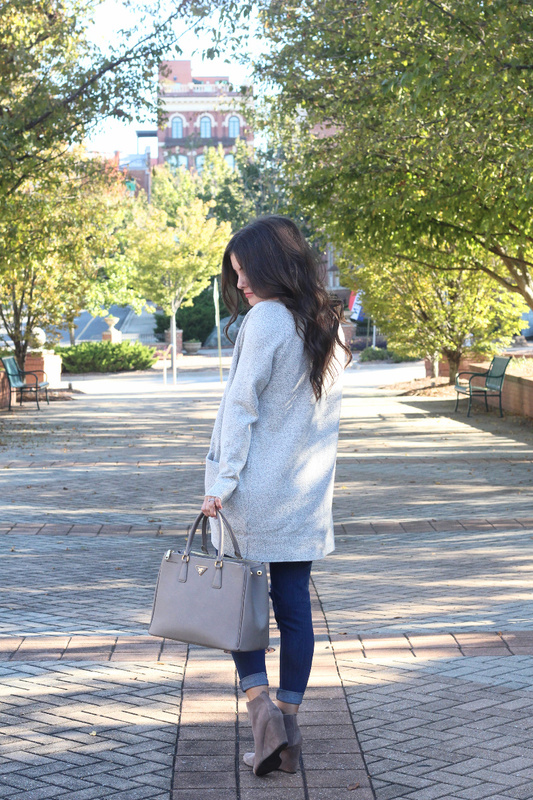 I bought this cardigan and I am not lying when I say it is the coziest thing in my closet at the moment. I also got the black one in an XXS for a more snug fit. They are so soft and literally go with everything! They also come in olive and burgundy. 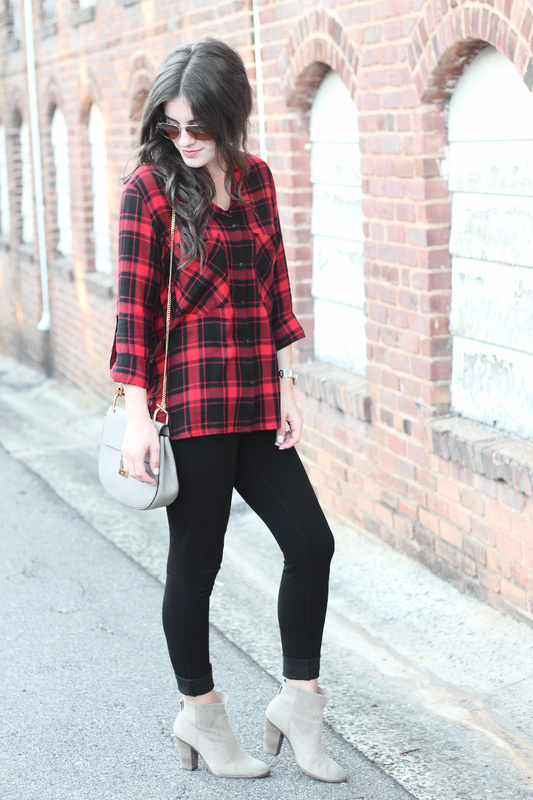 I love it paired with this tank and jeans but I would also wear it over a dress or different color pants/leggings. 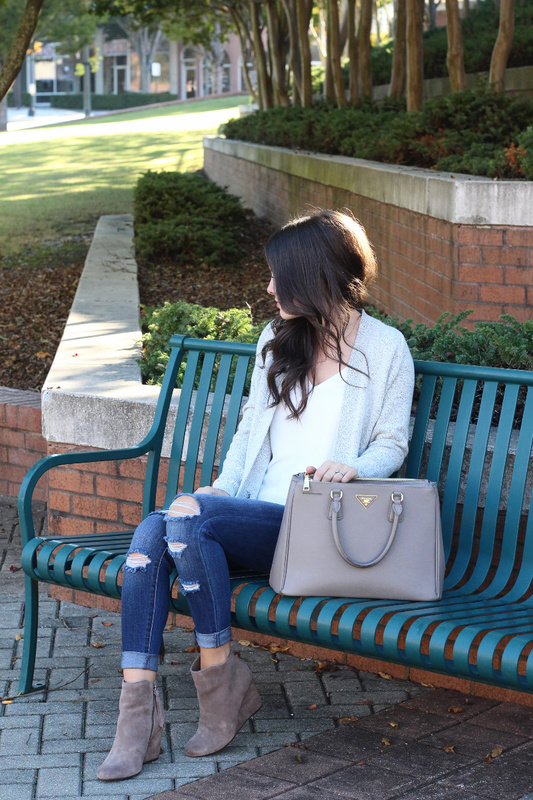 I have bought a few cardigans this season but these by far are my favorite, so I highly recommend them. 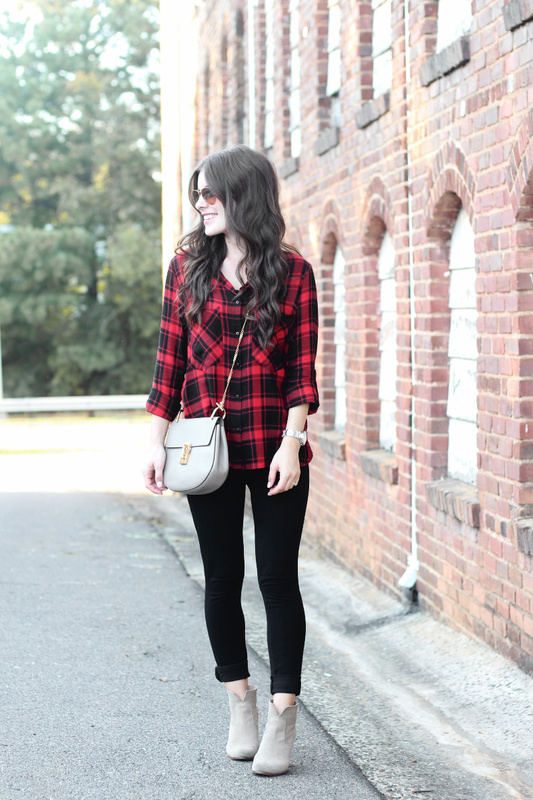 I love this outfit for fall because it is so versatile! 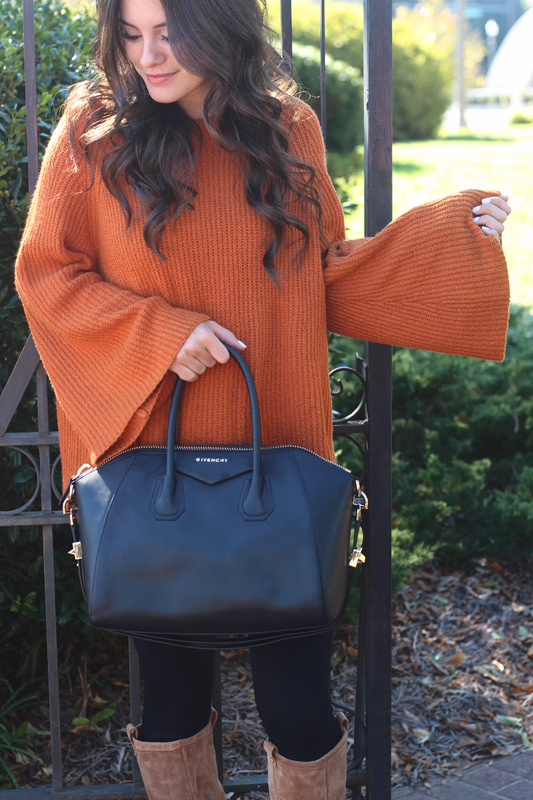 You can switch up any of the five pieces: cardigan, jeans, top, bag, or booties and it will transform the whole entire look! For example, if I traded this cardigan for the black version it would give you a whole different outfit. Same goes for changing the undershirt, etc... 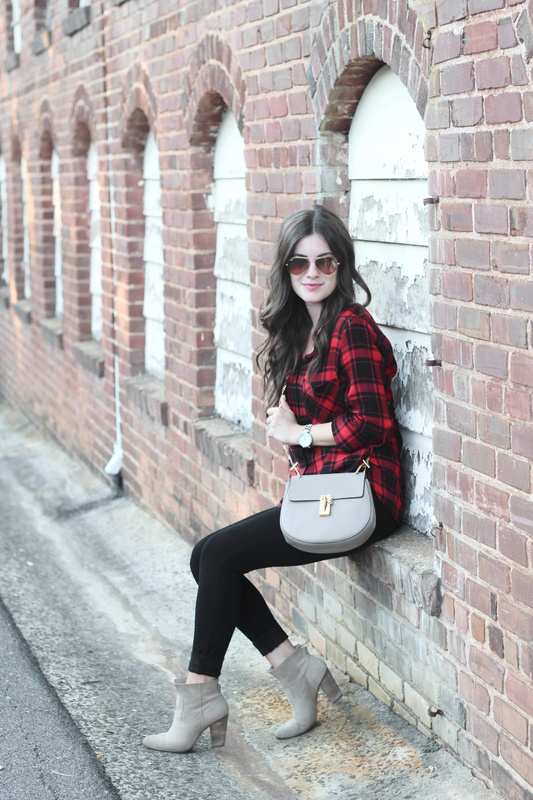 I love versatile pieces because you get your money's worth and allows you to make outfits out of stuff that is already in your closet. I'm thinking THIS one. The length is perfect and it is so soft! 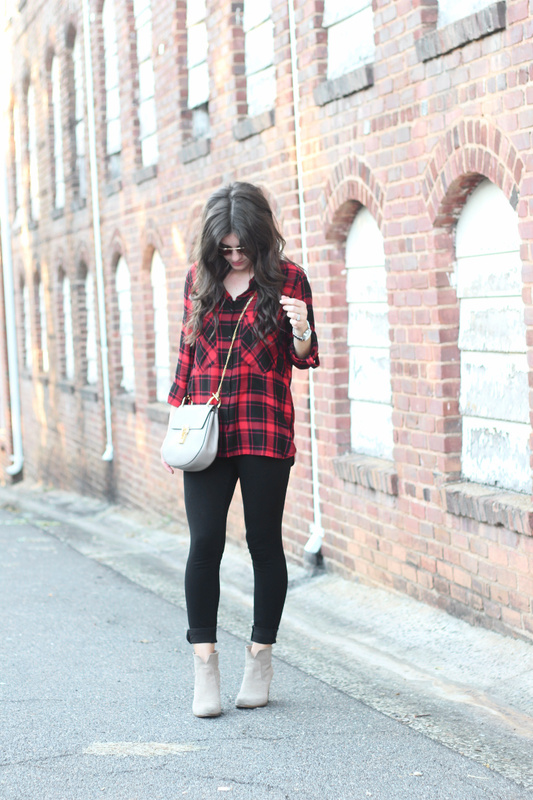 Also, love this one in particular because it is long enough to wear with leggings. 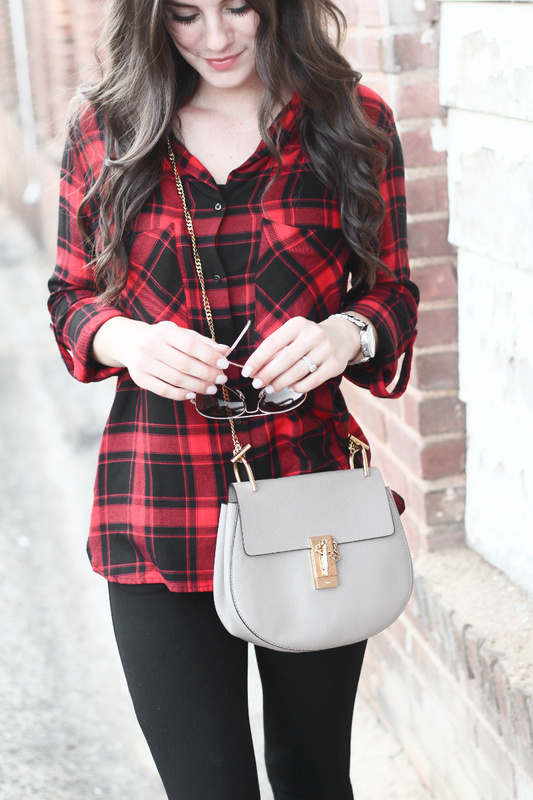 I love plaid button ups for fall with scarves or under vests. Happy Friday friends!! 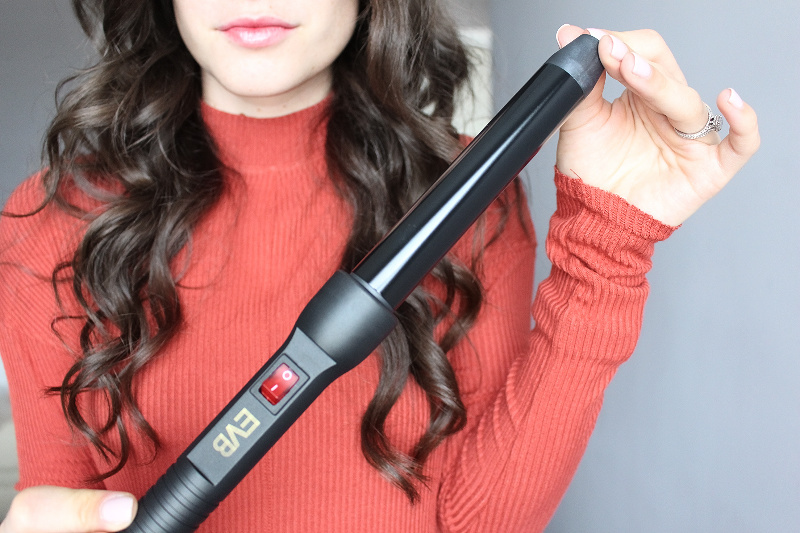 For todays Friday Five, I want to share 5 steps to getting gorgeous curls using the EV Beauty wand. I honestly have never heard of them before so I was excited to try them out. 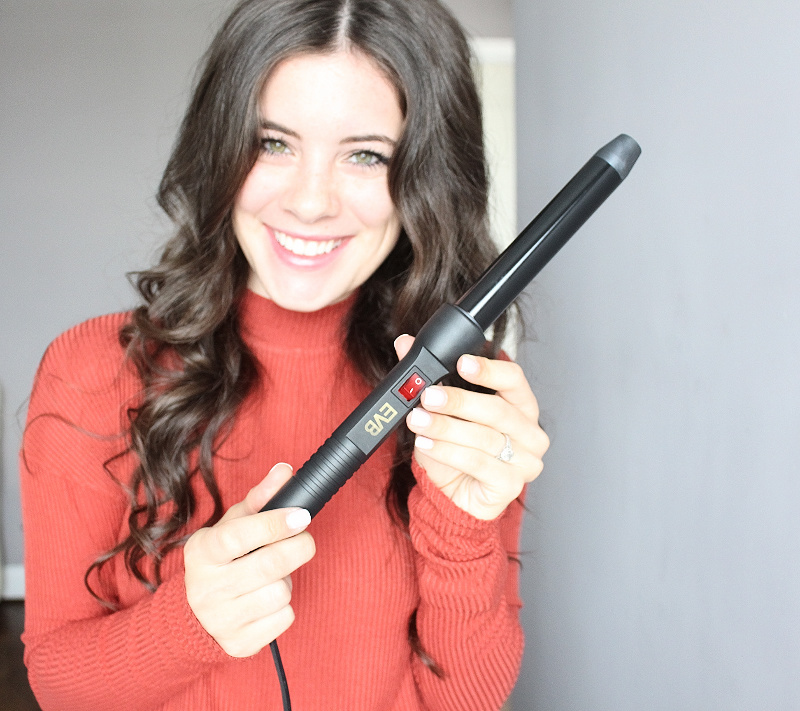 I usually use my T3 wand or Nume wand to curl my hair, which are both great wands, so I was excited to have something to compare it to. 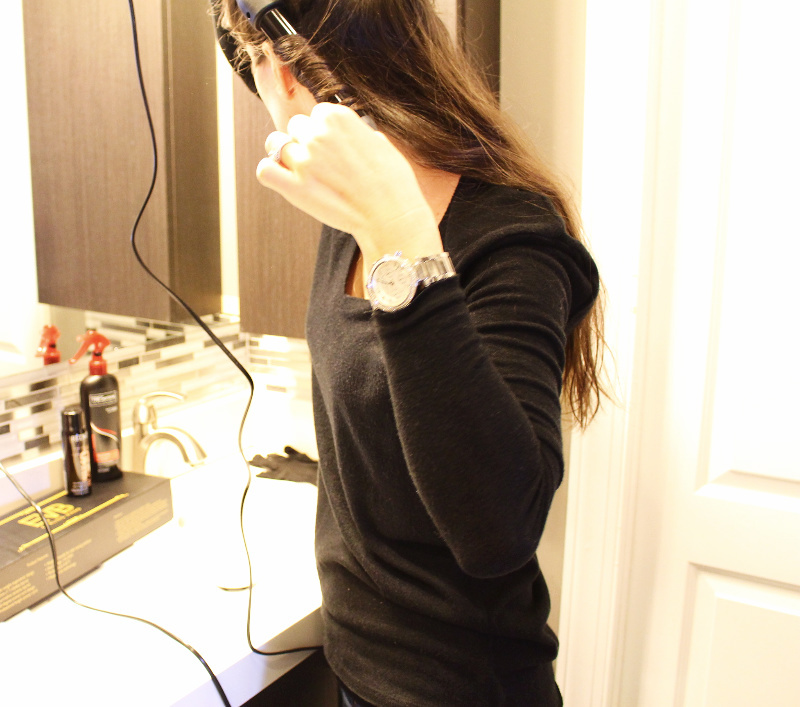 Make sure your hair is completely dry and split your hair into sections. 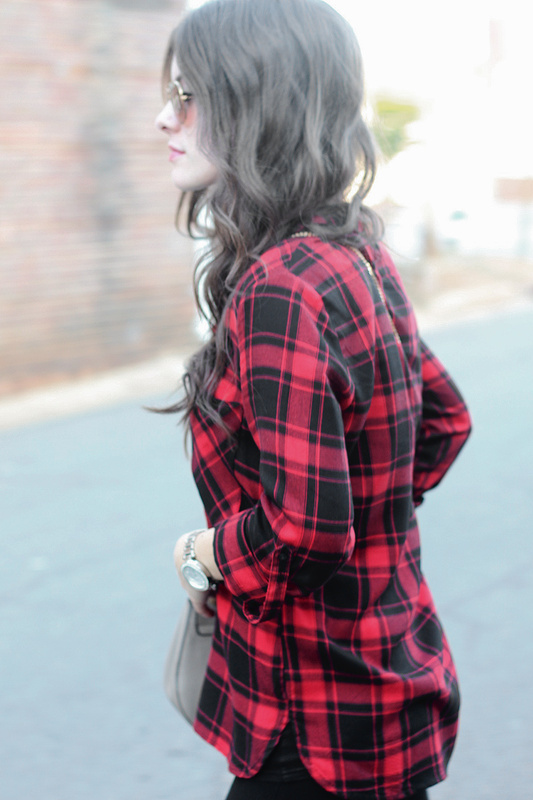 I usually pin my hair up and eventually curl four layers of hair because it is fairly thick. I also curl about a one inch piece of hair at a time. 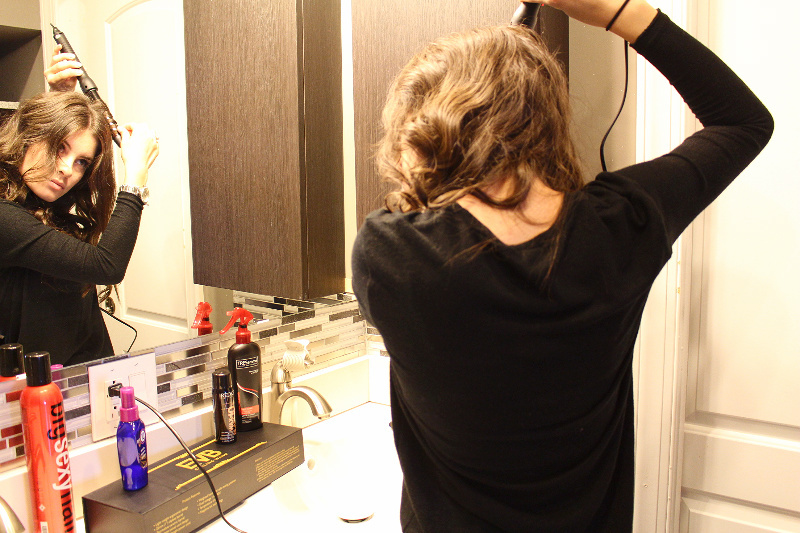 You can use a bigger or smaller piece of hair depending on how tight you want your curls. My curls tend to fall out slightly so I don't curl more than one inch at a time that way if they do fall out, it is still curly. Now for the actual curling process.... Grab a one inch section of hair and hold it tight. At this point you could use the heat resistant glove provided, but I have curled my hair so much that I tend to be ok without it. 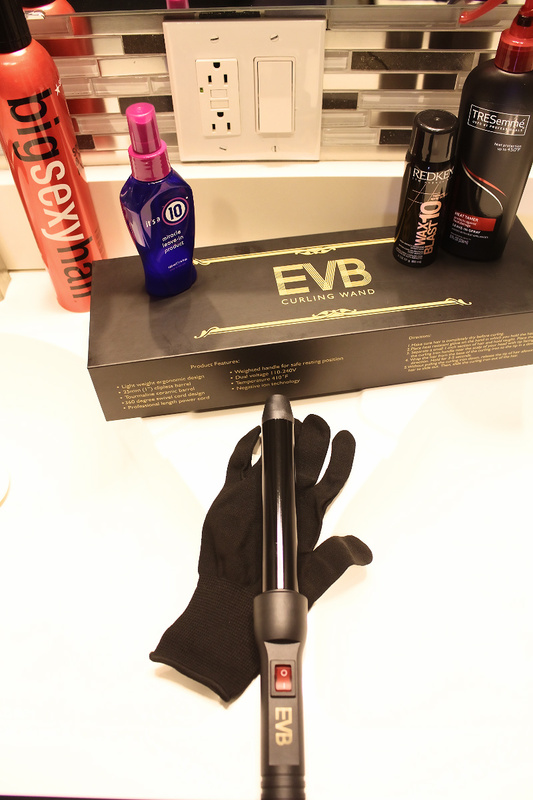 Take the EVB wand, hold it with the handle near the scalp and tip of the wand facing down. 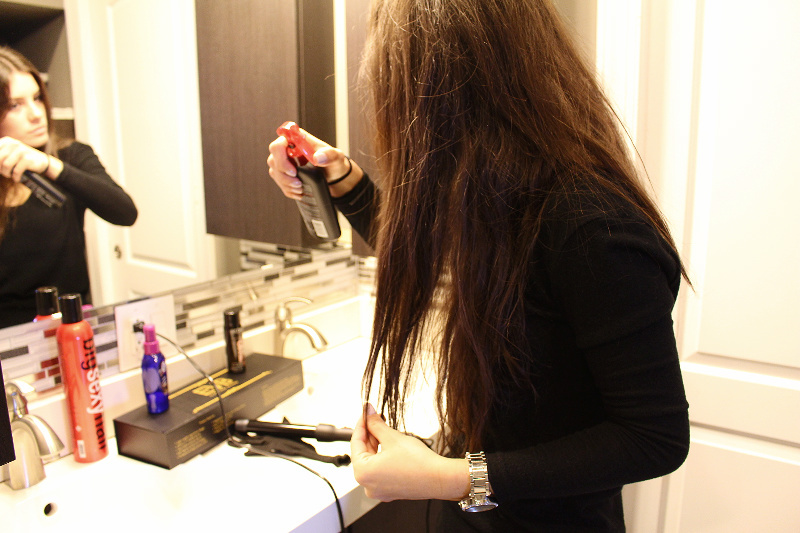 Wrap the one inch section of hair over the EVB wand wrapping from the handle down to the end of the wand. Make sure the section of hair stays tight and doesn't overlap for best results. 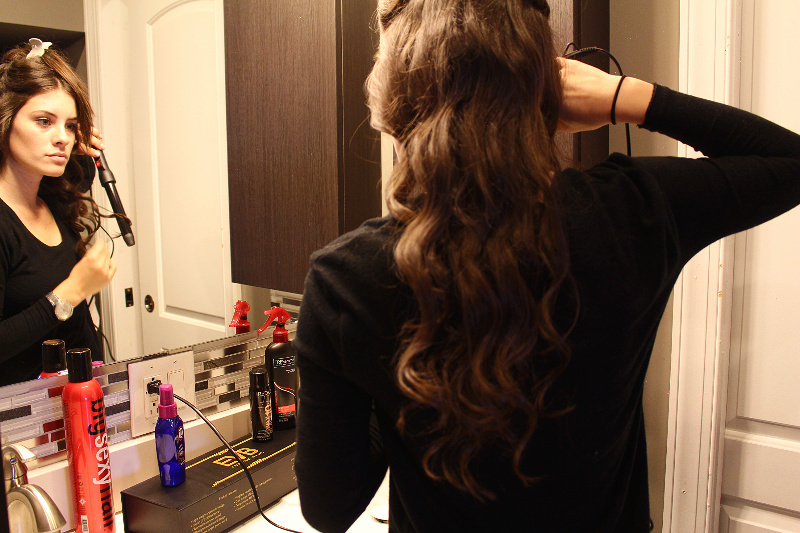 Then release the hair and let the hair slide out and then slide the curling iron out. 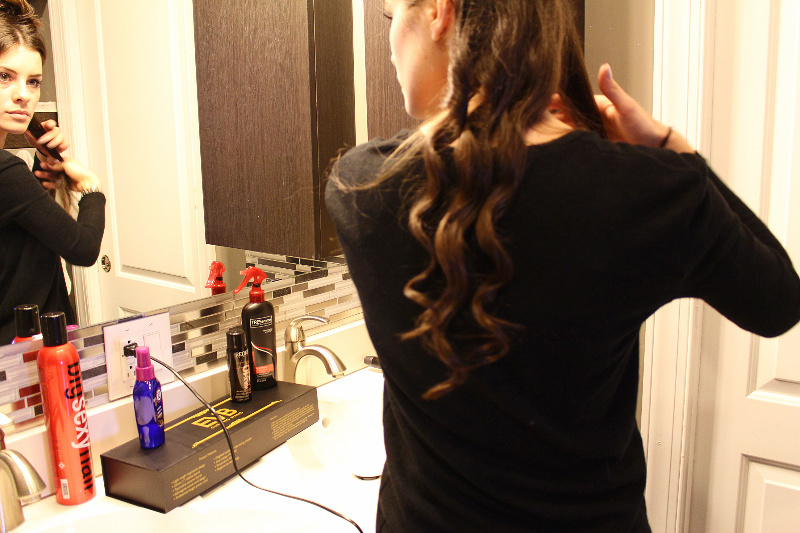 Don't try to unwind the hair or force the EVB wand out because that will ruin your curl. When I curl my hair, I usually curl the sections away from my face. Once I've curled my hair, I make sure that I didn't miss any strands and touch up any straight pieces of hair. Then I tease it using THIS teasing brush and THIS teasing spray. I tease the back section of my hair first then the left and right. Once I get the volume I want I use THIS hairspray to make it all stay in place. I love this hairspray because it has a great hold and doesn't leave my hair stiff. Put your makeup on, get dressed and look fab! You've got gorgeous hair!! I curled my hair with the EVB wand last weekend and was curious to see how long it will stay curled. I was so surprised that it lasted all day Saturday and only had to touch it up when I woke up Sunday. 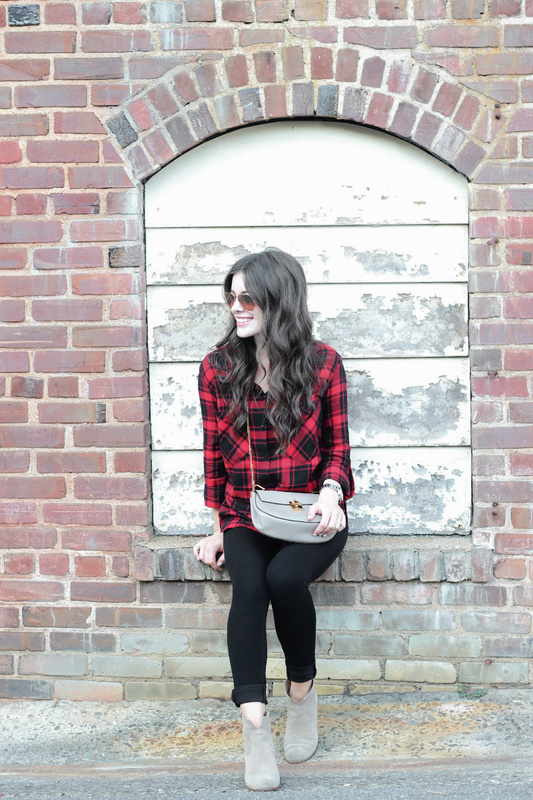 (I had my hair curled with the EVB wand in THIS post). This wand is a lot less expensive than other wands I have tried, so honestly I was shocked how much I actually liked it. I definitely recommend it if you are on the search for a new wand. If you have ever been to Charleston, this place might look familiar. 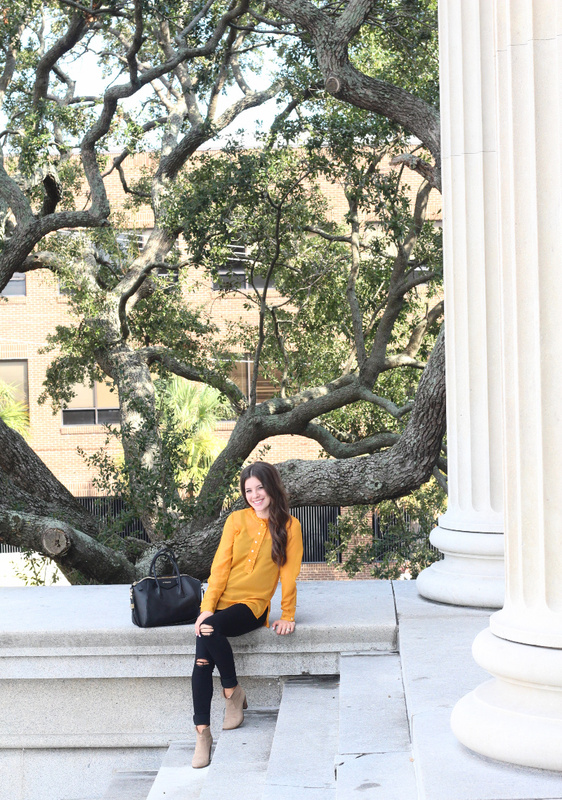 These photos are from when we went to Charleston a few weeks ago (trip review on THIS post if you missed it). 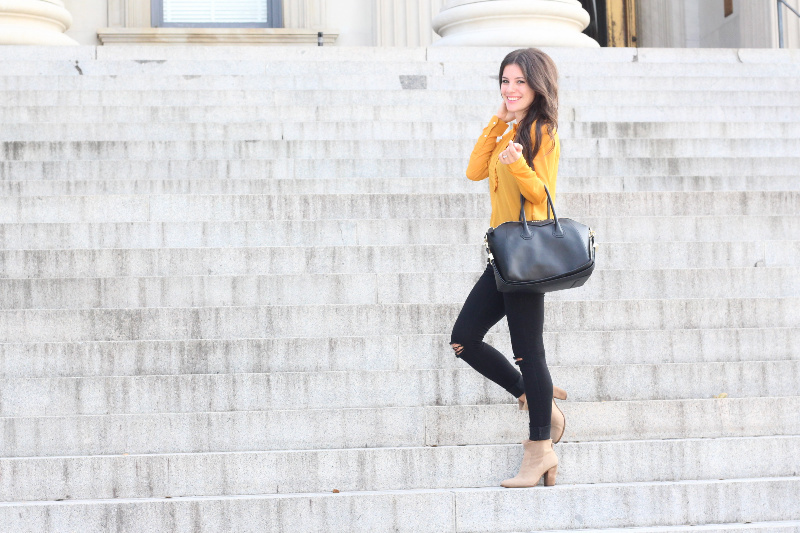 I was obsessing over this building, so sorry for the photo overload haha! 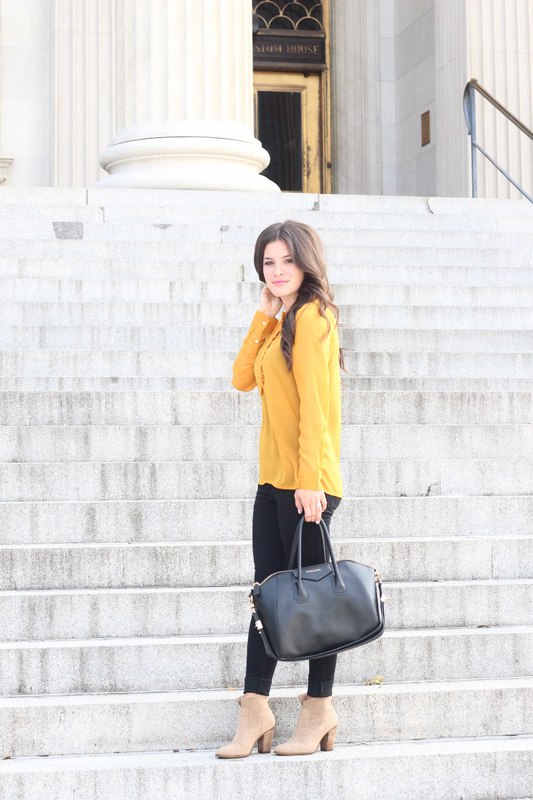 We did a little shopping while there and found this yellow top. 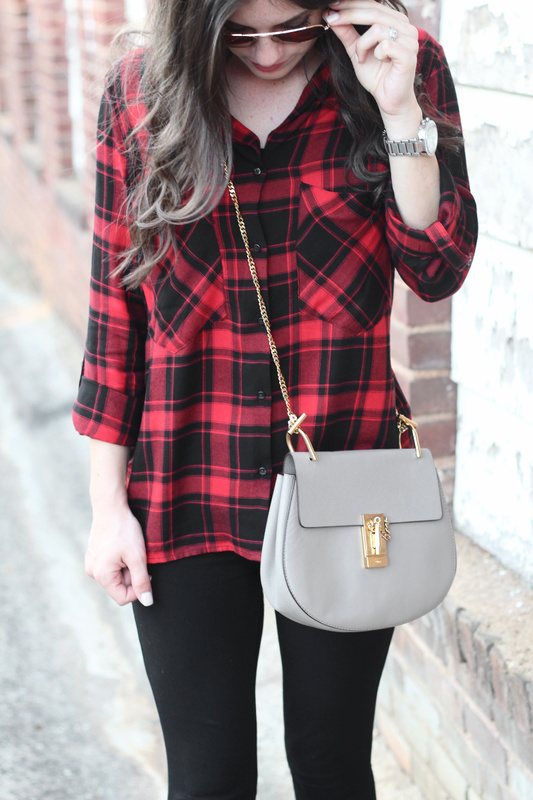 I am also obsessing over this color for fall. 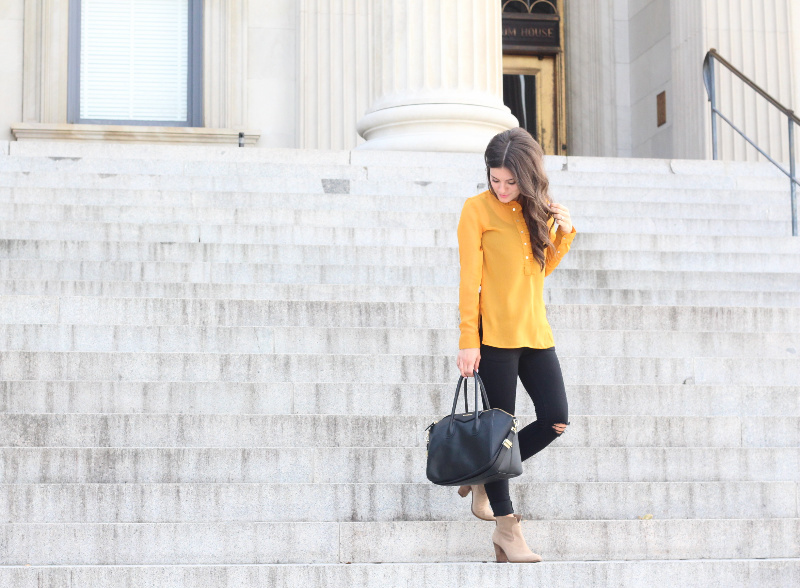 I feel like I have been saying that with every fall color, but I just love this mustard yellow. For some reason this top never made it in this color online but it does come in black and a yellow print if you really love the style. I will also put some more mustard yellow tops I love/have in the widget below. I hope you all are having an awesome Wednesday. I worked a shift yesterday, slept a few hours and headed to Florida for a short getaway. My husband is so sweet and let me sleep the whole way. He either really loves me or knows me enough to know how I get when I don't get enough sleep haha JK! Follow along on Insta Stories to see more from our trip! Thanks for stopping by, XO!